One of the most famous Austrian musicians, conductors and composers. Born Oct 35 1825 in St. Ulrich near Vienna - died June 3 1889 in Vienna . He was know as the Waltz King and is credited as founding the Viennese waltz era of the 18th Century. He played the violin. In his lifetime he composed over 400 waltzes, polkas and other works. The composer of the Famous Blue Danube, an unofficial anthem of Vienna and Austria. Most famous and recognized member of the Musical Dynasty of the Viennese Strauss Family. Son of Johann Strauss I and brother of Josef and Eduard Strauss. He created light dance music and operettas - some of the more famous include: Tales from the Vienna Woods, Eine Nacht in Venedig - A night in Venice’, Trish-Trash -polka, the Kaiser Franz Josef March,as well as the Operettas - The Gypsy Baron and Die Fledermaus. After his famous fathers death he merged both of their orchestras and continued the family dynasty with his brothers. 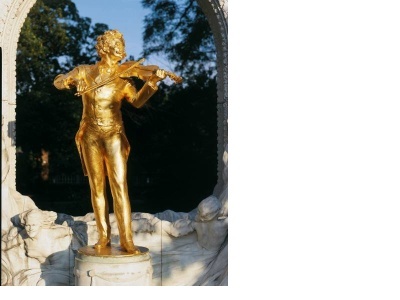 Monument of Johann Strauss in Vienna.